Ofir Barel is a researcher at the Yuval Nee'man Workshop for Science, Technology, and Security at Tel Aviv University. Elections are never a calm business - the fierce political competition, which requires politicians to sharpen positions and slander their rivals, inflames passions and makes the political discourse between supporters and opponents particularly contentious. This is especially true for elections in Israel. No matter when they are held, there will always be many significant issues in which the Israeli voter is required to decide: How should we deal with the ongoing security problems? Should we agree to the establishment of a Palestinian state? Should we enlist the yeshiva students in the army? And many other subjects that are unique to Israeli reality. In the current elections, to be held on April 9, the usual preoccupation with foreign affairs, society and economy issues are joined by a new issue—foreign influence operations. This problem is not unique to Israel: In the past two years, almost all democracies in the western world have had to deal - in theory or in practice - with this issue. 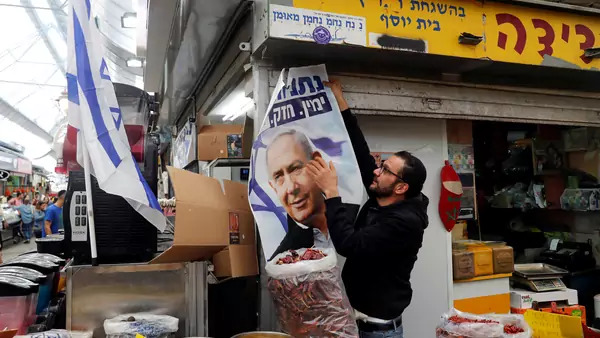 However, the danger of foreign influence campaigns on Israeli democracy is greater because of two internal characteristics peculiar to Israel. The first feature is the political instability of the Israeli regime. Israeli democracy, unlike many other democracies, is based on nationwide proportional representation, which leads to a great split in the Knesset. Accordingly, throughout its political history all the ruling parties in Israel were forced to establish their government by forming a coalition with other parties. This structure has erupted in political crises, with many governments prematurely ending their tenure before completing their four-year term in office. In fact, the elections to the Knesset take place, on average, every two years and nine months - a very high frequency compared to many democracies. The great political split (the 120 members of the twentieth Knesset belong to eleven different parties) is a symptom of the second characteristic— Israeli society is divided and polarized. The fundamental divisions not only include the great rifts, such as between the religious and the secular populations, but also subdivisions that exist within certain streams of Israeli society— non-Hassidic Haredim versus Sephardic Haredim, for example. These must be added to the existence of ultra-Orthodox and anti-Zionist groups, which do not even recognize the State of Israel. Political, economic, and social splits are the most important elements in the creation and distribution of fake news. Malicious actors tend to use fake news in order to heighten existing tensions between political, social, or religious groups. This weakened social cohesion makes societies more vulnerable to foreign influence campaigns. Many of the Russian trolls messages on social networks during the 2016 U.S. presidential elections did not focus on the presidential candidates, but rather were aimed at increasing tensions between American voters in the various issues of American society, especially between black and white Americans. By strengthening the conflicts, the Russian trolls sought to weaken the societal unity in the United States and public confidence in the U.S. democratic structure thereby influencing voting patterns. Israel’s inherent political instability, along with the great fragmentation of Israeli society, makes the country particularly vulnerable to foreign influence activities. Those who want to influence Israeli politics and foreign policy by disseminating fake news on social networks will be able to invest relatively limited and short-term efforts to exploit the existing divisions within the country. At the end of January, the technology firm Vocativ unveiled Iranian influence efforts, mainly on Twitter, which reached an estimated target audience of half a million Israeli users a month. The bots often rephrased authentic news headlines in a controversial manner to incite divisive responses from the electorate, focusing on issues such as wealth inequality, sexual harassment, poverty in Israel, and undermining of the Supreme Court. If successful, these efforts could lead to a shift of three or four seats on the electoral map, which may be very significant for determining the winning candidate of the upcoming elections. Despite the fateful potential of foreign influence campaigns, Israel - the "startup nation" - is lagging behind other countries in dealing with these campaigns. While some countries have developed coherent strategies for dealing with fake news, such as Denmark’s establishment of an inter-ministerial task force to counter influence operations in 2017, the current Israeli steps against online disinformation campaigns rely only on ad-hoc measures. For example, since the beginning of the election campaign, the Ministry of Foreign Affairs has worked with Twitter to identify and block more than 400 accounts that spread fake news. But what will happen after April 9? It can be assumed that regardless of the level of the foreign involvement in the upcoming elections, proposals to establish a permanent and long-term policy for dealing with foreign disinformation campaigns will be discussed. Based on worldwide experience and taking into account the Israeli reality, there are two steps that can be considered for effective Israeli policy. In 2017, the Central Elections Committee formulated recommendations to update the Propaganda Methods Law, which had not been updated since 1959. The recommendations included creating a duty of transparency for political publications on social networks (a step now being implemented by the Chairman of the Central Elections Committee, Judge Hanan Melcer), the prohibition of advertising of sponsored ads on networks on election day, the explicit prohibition to publish racist content during the elections, and improving the transparency of published election surveys. The legislative process for approving the recommendations was stalled, so its completion is vital. The second measure should be educational. In countries such as Canada, Belgium, and Croatia, there are varied media literacy campaigns and the Luxembourgian government implemented a national digital education strategy within its education system. Online influence operations for political needs are not limited to election campaigns and are becoming increasingly sophisticated. Therefore, it is important that the Israeli government formulate and implement relevant policies as soon as possible.